﻿Ancient root systems, unique leaf structure give aspens longevity. ﻿Before the last Ice Age ended around 10,000 years ago, fingers of the great northern boreal forests of spruce, ponderosa pine and aspen reached down into the mountains of West Texas. As the Ice Age ended, a few cold-hardy tree species managed to survive, harbored in the sky islands that dot the southern Rockies today. In Texas, a few small populations of aspen persist on the high peaks above 7,000 feet. They grow in the Guadalupe Mountains, on Emory Peak in the Chisos Mountains and below the summit of Mount Livermore in the Davis Mountains. Trembling (or quaking) aspen is the most widespread tree in North America. It occurs in most of Canada and Alaska and throughout the United States, except in the Southeast, and as far south as Guanajuato, Mexico. James Zech of Sul Ross State University studies the Texas aspens and admires their toughness. He describes how aspens are built to withstand the punishing climate of high altitudes where gale-force, limb-snapping winds are common and yearly temperatures range from below freezing to 100 degrees. Trembling aspens get their name from the way the leaves tremble when wind blows through them. The leaf stalk, called the petiole, is flat, so when a high wind moves through the tree, it makes the leaves quake, or tremble. This adaptation reduces the wind pull on the entire tree that could otherwise split the tree into pieces. Aspens are self-pruning – they drop their lower branches as they grow. This self-pruning is responsible for the scars visible on aspen trunks. The white, chalky bark is a sunscreen that shields the leafless trees from intense sunlight, especially in the winter when the trees are bare. Loose powder rubbed from the bark can be used as a natural sunscreen said to have a sun protection factor (SPF) rating of 5. Aspens lack the resins and oils found in pines and other conifers. As a result, aspens are less prone to burn when wildfires blow through the uplands. Intense fires will burn aspens down to their roots, and new, healthier stands regenerate from those roots. In fact, periodic fires benefit aspens because fires knock back the conifers that can shade aspens out. ﻿After a fire, aspens such as these in the Davis Mountains can regenerate from their root systems. In Texas, aspens are found in a few Trans-Pecos mountain ranges. Along with their lower-elevation cousins, the cottonwoods, aspens belong to the willow family. 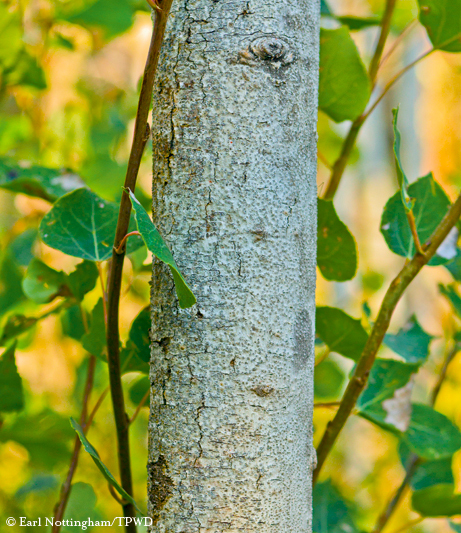 Like willows, aspen bark is rich in salicylic acid (the main ingredient in aspirin), which it uses as a chemical defense to ward off insect attacks. Young aspen forests provide habitat for a wide variety of wildlife, including black bear, deer, elk, ruffed grouse, woodcock and a number of smaller birds and animals. Each individual tree can live for 40–150 years above ground, but the root system of the colony is longer-lived. In some cases, this means that for thousands of years, the roots send up new trunks as the older trunks die off above ground. One such colony in Utah, given the nickname of “Pando,” is estimated to be 80,000 years old, making it possibly the oldest living colony of aspens. Aspen wood is light and fine grained, but fairly strong. It makes a great whittling wood. It is particularly favored for making matches and paper because its low flammability makes it safer to use than most other woods. If you have ever used a swamp cooler in the dead of summer, you have probably enjoyed the sweet smell of shredded aspen “wool,” the main ingredient in swamp cooler pads, as water drips through it. Shredded aspen wood is pet friendly, especially for animal bedding, because it lacks the phenols associated with pine and juniper, which are thought to cause respiratory system ailments in some animals. As stalwart as they are, aspens may not exist here in Texas forever. As temperatures increase in the American West, aspens will likely be among the first tree species in Texas to disappear. Zech says these Pleistocene relics are a reminder of the long-term natural cycles that shape our world. If you plan to see the Texas aspens, be aware that they are not that easy to get to. Before setting out to find them, be sure to ask a park ranger for directions and be prepared to hike.